Yay! 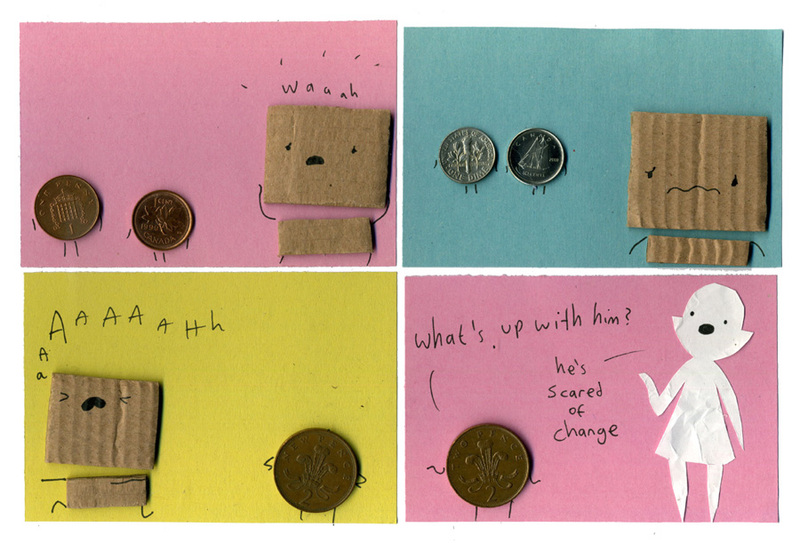 The Canadian change was my favourite part! I love that you have Canadian, British and American change in there. The question is, where did you get it? Alas, change is everywhere. Even in the air — see panel 2! Change is my favorite thing (both kinds). It’s so hard for me to identify with people who fear it, but I know they do. My significant other HATES it. It’s so funny. This one is great, tho. Somehow, I didn’t see it coming. Yay for the Canadian change! What I love when looking at British change is that one side is totally familiar to me since it has the exact same picture of the Queen, but the other side is appropriately foreign. She’s frowning on yours? Sad. People are prettier when they smile. Although I guess I shouldn’t talk, since all of the presidents on our money look like they just ate something rotten. It’s not a frown as such. Here’s a comparison photo http://twitpic.com/4vwaut I think the difference is on the Canadian money she’s having a pleasant trip away from home, and on the British coins she’s at work and it’s a Monday and it’s raining.